We offer 10 simple tips to install your garage opener that the typical instructions may not including! A manual may not always be enough when it comes to installing your garage door opener. Luckily, articles like this exist to give you the advice you need as well as step by step instructions to assist you in the installation. Using this guide, you'll have a functioning garage door opener in no time at all. With these expert tips, you just might find that the process is a lot easier. You'll want to look over your door as it is before you get started installing your new garage door opener. Make sure to check things like the brackets, rollers and torsion spring. While some parts you might be able to replace yourself, others will need the help of a pro. These parts are the torsion spring and roller brackets on the bottom, and they can be dangerous if you try to replace them yourself. It's better to pay a professional than wind up with an injury. On top of the parts, there are a number of things to check prior to installing an opener. One such thing is the balance of your door. Your door needs to be be properly balanced. 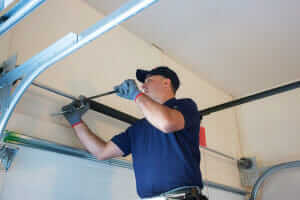 In order to check it, close your garage door and then pull the cord for emergency release. Next, open the door about halfway manually and then let go. If it moves up or down by itself, you'll want to call a professional to fix it. It's important to install an opener that is appropriate for your door. If you have a double garage door, then a 1/2hp will be suitable. If you have a heavier door made with wood or fake wood then you'll want something stronger, such as 3/4hp. For a single door, a 1/2hp or 1/3hp will do the trick. You'll also have to decide whether you want a chain drive, screw drive or belt drive. The cost and noise level of each will be important to pay attention to. First, put together your garage door opener and connect the header bracket and rail above your door. Then, set the garage door opener on a ladder, ideally an 8 foot one. This basically just keeps the opener in the right position as you take the measurements of the angle-iron. It's important to have the door open while you do this, but also make sure to use clamps to keep the door from accidentally closing. While there are often mounting straps that come in the kit for your garage door opener, they are often weaker than is ideal. Purchasing higher quality, slotted angle-iron from a hardware store can ensure that you get a stronger installation that will be more resistant to vibration. Once you've cut it to the correct size with a hacksaw, connect it right to the face on a joist using 1-inch lag screws. It can be tempting to install the opener more quickly by connecting it to parts already installed in your garage, but this isn't the best idea. The old parts may be more worn down than you might think and the new parts that come with your garage door opener are suited specifically to the new model. If there are any exposed wires that are part of your setup, make sure to replace those as well. Ideally, once your door experiences over 5 pounds of pressure, it should stop moving. This is a safety maneuver that can keep it from causing damage, injuring people or animals or generally causing problems. Try resting your foot against the door and opening it with a remote. If it continues moving rather than stopping at the pressure from your foot, you'll need to make adjustments to the force. One of the most time consuming parts of installing a tough build like this is getting the force settings right. Essentially, if you find that your door is stopping by itself while opening or closing then it needs adjustments. If it stops while closing, increase the force. This can take many small adjustments to get set just right, but it's exceedingly important that you do. Not all bulbs will be made for handling the vibrations and movements of a garage door opener. When you're shopping for bulbs, first make sure that you buy bulbs of the wattage listed in your manual. Otherwise, it may cause serious damage to the machine. Also, make sure you look for bulbs that have either “garage door” or “rough use” listed on the label. In some cases, your garage door may stop and then reverse while opening or closing. There can be a few causes of this. First, check the eyes. You'll want to make sure nothing is blocking them and that they are in good sight of one another. If that isn't the culprit, then look for loose wires. If the eyes appear to be in good shape then check for loose wires in the opener itself. 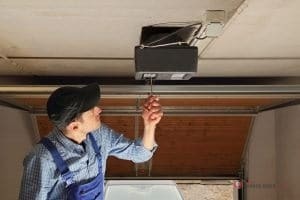 If you follow these tips as well as the instructions for the garage door opener you choose, then you'll surely end up with trouble-free operation. The installation can sometimes be time consuming, but it's well worth your while to make sure that you get it right. Check our guide about best garage door openers on the market today. Don't be afraid to call in a professional for certain part replacements or if there is a problem you just can't figure out. It's always better to pay a little more than to risk injury. Also, stick to your instructions as specified so that you can get the most out of your garage door opener.